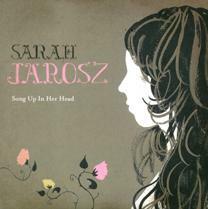 George Graham Reviews Saraj Jarosz' "Song Up in Her Head"
There are certain fields of music that lend themselves to prodigies -- it's generally the styles that value a high degree of musicianship and virtuosity, such as classical music and jazz. Bluegrass, which also celebrates fast pickers and impressive instrumentalizing, has certainly had its share of musicians to emerge at a quite young age, many of whom have gone on to be some of the most respected players in the field. Among the bluegrass prodigies who have emerged in the past few decades are Rickie Skaggs, Béla Fleck, Alison Krauss, Chris Thile and the members of Nickel Creek. This time, we have the recording debut of another very impressive young bluegrass musician, Sarah Jarosz (pronounced "ja ROSE") whose CD is called Song Up in Her Head. Eighteen year-old Sarah Jarosz is a native of Austin, Texas, and grew up and still lives in Wimberly, Texas, outside of Austin. Both of her parents are teachers, and Sarah got an early start, singing at age two, starting on piano at age six; and mandolin, her main instrument. at age 10. After her parents took her one time to a bluegrass jam session in Wimberly, she was hooked, and asked her parents to take her back every week. They were quite supportive of her music, taking her around the country to attend various bluegrass festivals and workshops, where she not only absorbed the music, she also started impressing other bluegrass players. She has been performing on the bluegrass circuit since age 12. In 2005, Ms. Jarosz made an appearance on the nationally televised tribute to Earl Scruggs on PBS-TV, and appeared with Scruggs and Ricky Skaggs. For her debut album, recorded when she was 17 and whose sessions had to be scheduled around her high school classes, Ms. Jarosz was joined by a very impressive list of some of the most respected names in the field, including Chis Thile, Tim O'Brien, fiddle great Stuart Duncan, percussionist Kenny Malone, Dobro ace Jerry Douglas, and mandolinist Mike Marshall, to name a few. Her CD was co-produced by Grammy-winning producer-engineer Gary Paczosa, who has worked with Thile on his own CDs as well as John Prine and others. One of the things that sets Sarah Jarosz apart from being just another young hot picker is that fact that she is an impressively mature vocalist and a very fine songwriter. In addition to her mandolin, she also plays clawhammer-style banjo on several pieces, giving an old-time feel. She is also heard on guitar, as well as piano on one piece. Her style owes more to the kind of singer-songwriter approach to the music of Alison Krauss, than to traditional bluegrass. She does include two instrumentals that show her instrumental abilities. All but two of the 12 songs on the CD are originals, and the covers come from unlikely sources: Tom Waits and the Decemberists. About the only time the CD comes up a bit short is the song Long Journey. Ms. Jarosz does it as a piano ballad. It's a nice song, but this style is not her strength especially vocally. I tend to use the adjective "impressive" in connection with a lot of notable debut recordings. Sarah Jarosz' Song Up in Her Head really does warrant that description for this delightful recording made by a then-17-year old who has been winning fans among bluegrass pickers since she was 12. She is a triple threat as an instrumentalist, singer and songwriter -- and there are not that many in the bluegrass world who excel at all three. Also notable about Ms. Jarosz is that thanks to her supportive parents, she has kept her musical career from interfering with academics. She graduated from high school this year, and is heading for college is Boston in the fall, so she'll be performing and touring when her studies will permit. And speaking of others being supportive, she has really racked up a truly heavyweight cast of some of Nashville's finest, most established instrumentalists to appear on her CD, which certainly can't hurt. For our audio quality grade, will give the CD a "B," with the acoustic instruments and Ms. Jarosz' vocals captured well. But we'll give the demerits for the usual unnecessary volume compression on the recording. Does anyone actually think that this CD will somehow be less successful if it is not extra loud? Many have lamented that today's youth is becoming passive, being entertained by video games and when they do try to make music, it's by sampling and mashing up existing material. Sarah Jarosz is cause for considerable optimism, as well as delight, as she carries on and brings her own approach to some great American music.